Colombo, January 17: A harsh pre-independence sedition law, originally meant to maintain the stranglehold of a foreign power on India, has survived both independence and the establishment of democracy thereafter. Although the makers of the Indian constitution had made it a point not to include a provision against “sedition”, the law has survived as Section 124A of the Indian Penal Code (IPC) and has been grossly misused in the past 70 years. Governments of all hues and even private citizens, have used it against dissenters and rivals who cross arbitrarily set “red lines”. The highest courts have repeatedly given rulings setting limits to the use of Sec 124A IPC. But this has had no effect, partly because the provision is a convenient and effective instrument of control, and partly because India has, over the years, become a paranoid “national security State”, unsure of its stability and longevity. The slightest deviance is viewed by the powers-that-be and the State’s ideologues as a serious threat to national security. Bu the plethora of sedition cases makes a mockery of the constitutionally guaranteed freedom of speech and thought. 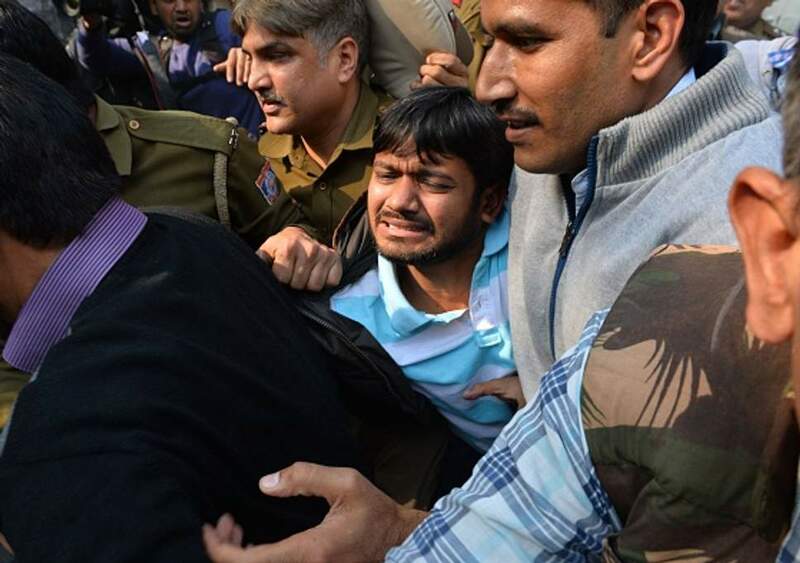 A case which is in the limelight now is that against some student leaders of the prestigious Jawaharlal Nehru University (JNU) who had allegedly shouted anti-national slogans in a meeting in 2016. The meeting had been convened to observe the anniversary of the hanging of Afzal Guru who had allegedly participated in a plot to attack the Indian parliament in 2001. But the case against the students is believed to be based on flimsy and unauthenticated evidence allegedly manufactured by the police at the instance of Bharatiya Janata Party (BJP) activists. It was also widely reported that the death sentence on Afzal Guru was itself based only on circumstantial evidence. The timing of the case showed that it was a part of the BJP’s campaign for the May 2019 parliamentary elections in which it is attempting to portray its rivals and opponents as agents of Pakistan and Pakistan-backed terrorists. Recently, sedition charges were filed against the 80 year old Assamese scholar Dr. Hiren Gohain, journalist Manjit Mahanta and Akhil Gogoi. These were based on speeches they had allegedly made at a rally which alluded to the possibility of a demand for independence and sovereignty of Assam if the Citizenship (Amendment) Bill was passed by parliament. These cases have caused much public outrage in Assam where the Citizenship Bill, which allows immigration of Hindus from neighboring Muslim countries, is widely opposed because that could reduce the indigenous population. After former India cricketer and Congress leader Navjot Singh Sidhu hugged Pakistan Army Chief General Qamar Javed Bajwa, an Indian lawyer filed a sedition case against Sidhu. Advocate Sudhir Kumar Ojha alleged that Sidhu “insulted” the families of Indian soldiers by hugging Gen.Bajwa. Ojha had previously filed cases against Bollywood star Aamir Khan and his wife Kiran Rao, for their remark that India had become “‘intolerant towards minorities.” He filed a case against Congress leader Digvijaya Singh for calling Godman Baba Ramdev a “thug”. South Indian film star Divya Spandana had a sedition case slapped against her for saying on social media that Pakistan is not a bad country. Section 124A was invoked against the Patidar community leader Hardik Patel who has been asking for job reservations for the Patidars in government. Litigants are filing cases and the lower courts are entertaining them because of the wording of Sec 124 (A). Under Sec. 124A of the IPC an offence of sedition is committed when any person by words or otherwise brings or attempts to bring into hatred or contempt, or excites or attempts to excite disaffection towards the government established by law. Sedition is a cognizable offense. A sedition case cannot be withdrawn by the complainant since it is a serious offence .It is also non-bailable. The maximum punishment for the offence is life imprisonment, with or without a fine. However, as per Sec 196 of the Code of Criminal Procedure proceedings of sedition cannot be initiated without the written consent of the State government or the district magistrate. But this has not been a safeguard because governments themselves have been initiating cases in an unrestrained way. India’s freedom fighters, founding fathers of the constitution and the superior courts have been against the sedition law. Following Nehru’s observations, the courts became lenient in sedition cases. In the Kedar Nath Singh v State of Bihar case in 1962, the Supreme Court said that criticism of those in positions of power would not amount to sedition. It also stated that a sedition case required to be against acts which were intended to have the “effect of subverting the Government” by violent means. It further said that mere slogans and verbal attacks against the government would not amount to sedition. It was in the same year that the Dravida Munnetra Kazhagam (DMK) leader C.N.Annadurai told the upper house of parliament that ” the Dravidians demand the right of self-determination. We want a separate country for southern India.” The then Indian government did not slap a sedition charge against Annadurai. In 1995, in the Balwant Singh case, the Supreme Court held that shouting “Khalistan Zindabad” (Hail independent Sikh State of Khalistan) does not amount to sedition. Since then, the courts have consistently said that as long as an assault is verbal and not physical or violent, it cannot be considered sedition and that it will be fully covered by Article 19(1) of the constitution which guarantees freedom of expression. In fact, the liberty to speak in defiance of accepted beliefs and systems should upheld as a mark of democracy, the courts have said. In 2018 ,the Law Commission said in a concept paper that the sedition law has to be re-visited. “In a democracy, singing from the same songbook is not a benchmark of patriotism. People should be at liberty to show their affection towards their country in their own way. For doing the same, one might indulge in constructive criticism or debates, pointing out the loopholes in the policy of the Government. Expressions used in such thoughts might be harsh and unpleasant to some, but that does not render the actions to be branded seditious,” the concept paper said. “While it is essential to protect national integrity, it should not be misused as a tool to curb free speech. Dissent and criticism are essential ingredients of a robust public debate on policy issues as part of vibrant democracy. Therefore, every restriction on free speech and expression must be carefully scrutinized to avoid unwarranted restrictions,” the Law Commission said.